Heading into Tuesday's council session, Hans Riemer, who served a one-year term as council president, told his colleagues: "We welcome new voices to county leadership — we are looking forward to your contributions." WASHINGTON — One day after they were sworn in, members of Montgomery County’s nine member council are getting to work. Among their first chores is getting a briefing on priorities for the upcoming legislative session in the Maryland General Assembly in Annapolis. There are four new council members: Andrew Friedson will represent District 1, and Evan Glass, Will Jawando and Gabe Albornoz are serving at-large. 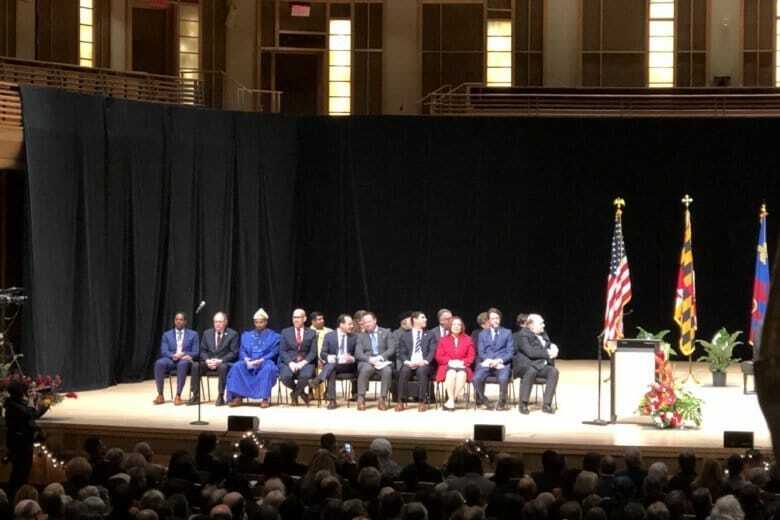 At Monday’s inaugural ceremony, Montgomery County Executive Marc Elrich, who wrapped up 12 years on the county council before winning the county executive post, pledged to work in a collaborative style with the council. In his inaugural speech, Elrich said he would not raise taxes “this year,” which leaves open the possibility of tax increases in the future. The county executive makes budget proposals, but final say on spending ultimately falls to the council. Heading into Tuesday’s council session, Hans Riemer, who served a one-year term as council president, spoke to his colleagues, with a special recognition of the body’s four new members. “We welcome new voices to county leadership — we are looking forward to your contributions,” Riemer told them.